Is that headline a little too glass-half-empty? After all, the Yankees didn't see their 1.5-game lead in the A.L. East shrink at all last night, either: Baltimore had already lost to Toronto before the Twins finished off the Yankees at Target Field. If nothing else, it's another game off the schedule, and so with just eight games left now, there are worse things than the status quo. But the Yankees and Orioles spent so much of September within a game of each other that the 1.5-game lead the Yankees enjoyed heading into play last night seemed downright comfortable — which is, of course, insane. Hoping they could extend that lead to a whole 2.5 games — especially after Baltimore's game ended last night — is hardly greedy. 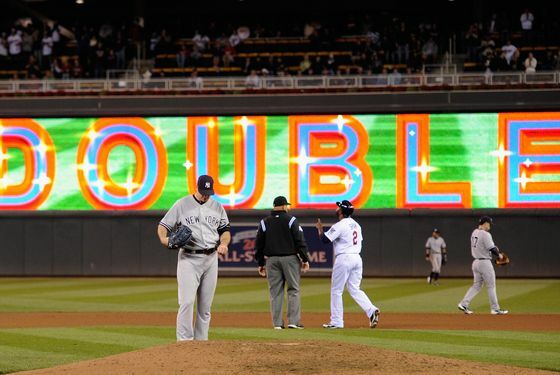 The Yankees had their chance last night: They led 3–1 in the seventh when Minnesota loaded the bases off Phil Hughes. With two outs and four straight lefties due up, Joe Girardi called on Boone Logan, who threw a wild pitch (plating Minnesota's second run), allowed a double to Denard Span (giving the Twins a 4–3 lead), walked a batter, then surrendered a Joe Mauer single that gave the Twins a two-run cushion. The Yankees would get one of those runs back in the ninth on an Andruw Jones pinch-hit home run, but Jayson Nix would strike out to end the game. The Yankees have been winning a lot of games over the past week or so, so these things will happen — but it's an opportunity wasted nonetheless. • The Yankees still have that 1.5 game lead in the East, with Tampa Bay five games out of first. For what it's worth, on its playoff odds page, Baseball Prospectus has the Yankees winning the division 87.6 percent of the time, given their current position.